How cool would this be? One enterprising fan has made a theatrical one-sheet poster for the fictional biopic movie Stan Lee. And they've cast Heisenberg in the lead role. 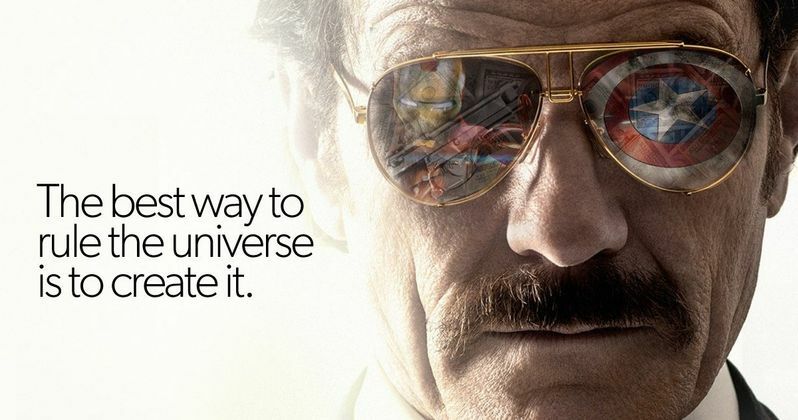 Yes, this awesome images features everyone's favorite Breaking Bad star Bryan Cranston as the one and only Stan 'The Man' Lee, founder of Marvel. Though the movie isn't in-development as far as we know, it might just get a green light after everyone gets a load of this. The epic tagline reads as such. "The best way to rule the universe is to create it. Bryan Cranston is Stan Lee. April 2017." Of course, don't get your hopes up. There's definitely no Stan Lee biopic planned for next spring. But it does beg the question, who would release such a movie? Would it be an official Marvel Studios release? Would a rival company tackle the man's legacy? Or would it be an independent movie that couldn't really utilize any of the man's superhero creations in telling his story? Where ever it landed, the Stan Lee movie would surely be fascinating. And the funnest part may be seeing the real deal playing himself in a signature Stan Lee Cameo, which he'd surely do. Placing Bryan Cranston at the epicenter of this tale also sounds like a masterstroke of casting, especially after seeing this image. Is there another actor who could do the role as much justice? For an idea of Stan Lee's accomplishments, we look to Wikipedia for what the biopic's synopsis might look like. "Stan Lee (born Stanley Martin Lieber, December 28, 1922) is a comic-book writer, editor, publisher, media producer, television host, actor and former president and chairman of Marvel Comics. In collaboration with several artists, including Jack Kirby and Steve Ditko, he created Spider-Man, the Hulk, the Fantastic Four, Iron Man, Thor, the X-Men, and many other fictional characters, introducing a thoroughly shared universe into superhero comic books. In addition, he headed the first major successful challenge to the industry's censorship organization, the Comics Code Authority, and forced it to reform its policies. Lee subsequently led the expansion of Marvel Comics from a small division of a publishing house to a large multimedia corporation. He was inducted into the comic book industry's Will Eisner Award Hall of Fame in 1994 and the Jack Kirby Hall of Fame in 1995. Lee received a National Medal of Arts in 2008." As you can see, there is a lot of meat on what could potentially be one of the best biopics ever crafted for the silver screen. Though we suspect that the Comics Code Authority part of his story might take front and center to give the movie some narrative weight and structure. Especially if the movie isn't from Marvel Studios, as a biopic from any other studio would most likely have to abandoned showing some of his greatest creations on screen. Take a look at the poster, which came courtesy of EntertainmentWeakly.Tumblr.com.